by various authors on GFD, climate etc. Coriolis 1835. Memoire sur les equations du mouvement relatif des syst\`emes de corps (On the equations of relative motion of a system of bodies. J. Ec. Polytech., 15, 142-154. 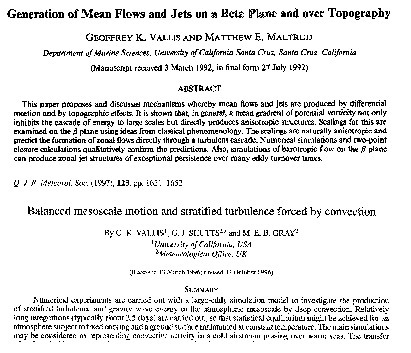 The above two papers are the original ones on the eponymous Coriolis force. Coriolis was thinking more about mechanical systems than about the effects of the Earth's rotation. For an interpretation, see the article by Persson in the historical articles section. It seems that Laplace and Gauss may have inferred the 'Coriolis' force prior to Coriolis. However, I don't have the references and don't know the background; if someone can fill me in, let me know. Ekman, V. W. 1905. On the influence of the Earth's rotation on ocean currents. Arch. Math. Astron. Phys., 2, 1-52. This is the classic paper on Ekman layers. Ekman was a student of V. Bjerknes (Bjerknes sr.), and this study was the result of a question by F. Nansen, the polar explorer and statesman, who apparently wanted to understand the motion of pack ice, and his ship, the Fram, embedded in the ice. Nansen may in fact already have had an intuitive understanding of the effect before asking Ekman. Interestingly, although we have de-personified various concepts in GFD --- the Brunt Vaisala frequency has commonly become the buoyancy frequency, for example --- Ekman layers remain Ekman layers. Greenspan, H. P. and Howard, L. N., 1963. On the time-dependent motion of a rotating fluid. J. Fluid. Mech., 17, 1385-404. In a now-classic calculation, Greenspan and Howard consider the development, or spin-up, of the state of rigid-body rotation of fluid in a rotating cylinder, including the development of an Ekman layer. Aside: we should reference the papers below as 'Thomson (1969)' etc and not as 'Kelvin (1869)'. This is because, although William Thomson later became Lord Kelvin, the papers are published under the name Thomson. (The name Kelvin is taken from the River Kelvin, which flowed past Glasgow University.) We may, however, certainly refer to 'Kelvin's circulation theorem'. In contrast, Lord Rayleigh was born to the aristocracy: he was the third Baron Rayleigh, son of the second Baron, and his papers may be referenced as Rayleigh (1877) etc. Thomson, W. (Lord Kelvin) 1869. On vortex motion. Trans. Roy. Soc. Edinburgh., 25, 217-260. This paper gives rise to Kelvin's circulation theorem. Thomson, W. (Lord Kelvin) 1879. On gravitational oscillations of rotating water. Proc. Roy. Soc. Edinburgh, 10, 92-100. This is the 'Kelvin wave' paper. Thomson, W. (Lord Kelvin) 1871. Hydrokinetic solutions and observations. Phil. Mag. Ser. 4, 42, 362-377. Among other things, this paper derives the instability that arises when wind blows over water, a form of Kelvin-Helmholtz instability. Silberstein, L., 1896. O tworzeniu sie wirow, w plynie doskonalym (On the creation of eddies in an ideal fluid). W Krakaowie Nakladem Akademii Umiejetnosci (Proc. Cracow Acad. Sci. ), 31, 325- 335. Also published as: Uber die Entstehung von Wirbelbewegungen in einer reibungslosen Flussigkeit in Bull. Int. Acad. Sci. Cracovie, Compte Rendue Sceances Annee, 280-290, 1896. Engl. transl. by M. Ziemianski. It was Vilhem Bjerknes (father of J. Bjerknes) who, referencing Silberstein, realized the geophysical implications in 1898. I will post the Bjerknes articles in the fullness of time. Rossby, C-G., 1936. 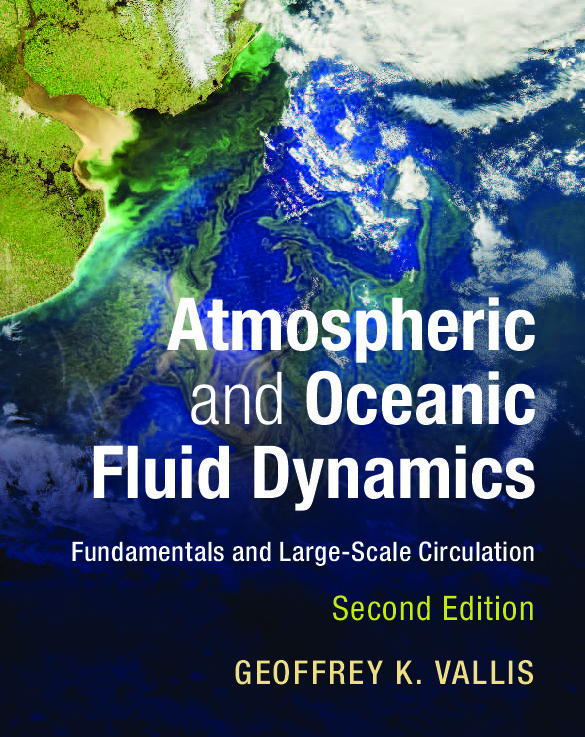 Dynamics of steady ocean currents in the light of experimental fluid dynamics. Papers in Phys. Oceanog. and Meteor., 5, 1-43. Rossby, C-G., 1938. On the mutual adjustment of pressure and velocity distributions in certain simple current systems, II. J. Mar. Res., 5, 239-263. Rossby, C-G., 1940. Planetary flow patterns in the atmosphere Quart. J. Roy. Meteor. Soc. (suppl), 66, 68-87. Ertel generalized Rossby's work to nonhydrostatic and continuously stratified flows (Ertel 1942). He almost certainly knew of Rossby's work, having visited MIT in 1937. English translations of many of Ertel's papers are to be found in the next reference. See also the unpublished historical article by Samelson (2003). Schubert, W. et al. 2004. English translations of twenty-one of Ertel's papers on geophysical fluid dynamics. Ertel, H and Rossby, C-G., 1951. A New Conservation theorem of Hydrodynamics. Geofis. Pura Appl., 189-193. Ertel, H and Rossby, C-G., H.-l. 1951. Ein neuer Erhaltungs-satz der Hydrodynamik. (A new conservation theorem of hydrodynamics) Sitzungsber. d. Deutschen Akad. Wissenschaften Berlin, 1, 3-11. The two papers above are Rossby and Ertel's two joint papers, follow-ons to their discoveries on PV conservation and discussing related invariants. Rossby, C-G. and collaborators, 1939. 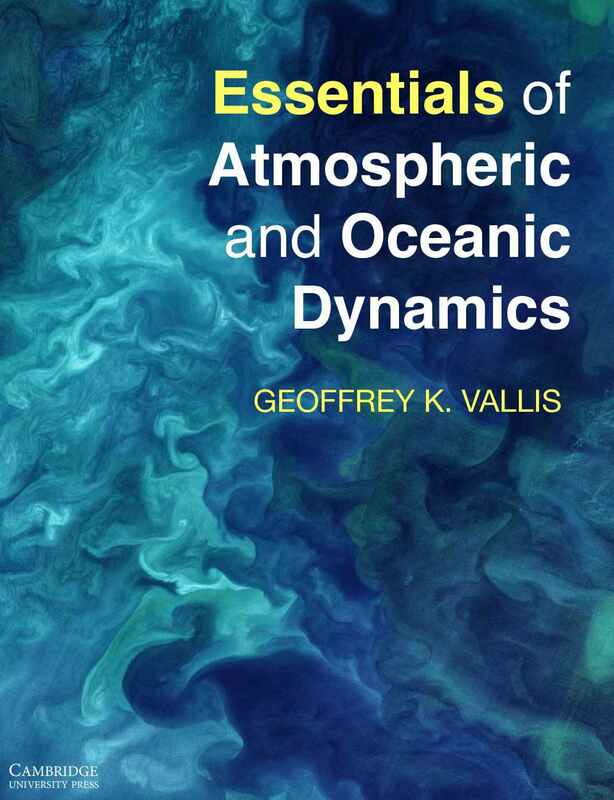 Relation between variations in the intensity of the zonal circulation of the atmosphere and the displacement of the semipermanent centers of action. J. Marine Research, 2, 38-55. Reynolds, O. 1895. On the dynamical theory of incompressible viscous fluids and the determination of the criterion, Phil. Trans. R. Soc. Lond. A, 186, 123-164. This is the paper in which Reynolds introduced the eponymous 'Reynolds decomposition'. An early paper investigating the effect of a system of eddies on the velocity and temperature structure in the atmosphere. Taylor introduces the notion of an 'eddy conductivity' with mixing length arguments. Turbulent diffusion has its roots in this classic paper by Taylor (and the 1914 paper above) and in more Eulerian papers by Prandtl at about the same time. Continuing Taylor's investigations into turbulence. Lee, T. D. 1951. Difference between turbulence in a two-dimensional fluid and in a three-dimensional fluid. J. Applied Phys., 22, 524. Lee's half-page paper, one of the first on 2D turbulence, notes that because vorticity is conserved on parcels, the Kolmogorov energy spectrum cannot hold in the way it does in three dimensions. Fjortoft, R., 1953. On the changes in the spectral distribution of kinetic energy for two-dimensional nondivergent flow. Tellus, 5, 225-230. Fjortoft's paper is one of the first to note that there will be a transfer of energy to larger scales in two-dimensional turbulence. A similar result was independently (one presumes) noted by Batchelor in his 1953 book, 'Theory of Homogeneous Turbulence' (p.187). He deduced that from the original motion 'will gradually emerge a few strong isolated vortices.' Using a statistical argument Onsager (1949) had previously come to a similar conclusion. These prescient deductions were graphically confirmed by later numerical simulations. Welander, P. 1955. Studies on the general development of motion in a two-dimensional, ideal fluid. Tellus, 7, 141-156. This is another early paper on two-dimensional turbulence. Of note is the description (and very graphical figures) of the deformation of a passive tracer and the continual extension of fluid elements, a manifestation of the tracer cascade to small scales and leading to chaotic mixing. The main development of the statistical theory of two-dimensional turbulence came a few years later, by Kraichnan, Batchelor and Leith. I'll post these papers before long. Subsequent developments have studied the effects of coherent structures - jets and vortices, for example - that, among other things, make the statistical theories non-exact. The papers by Charney and Eady are both true classics, for they independently deduced the hydrodynamic instability that gives rise to weather. It is the hydrodynamic instability that probably most affects the human condition, and certainly the one that is talked about most. Eady's model is more austere, more analytically tractable and displays the instability in a more transparent fashion (or so it seems to me). Charney's model is more complete, in that is includes the beta effect, and more realistic. Both models were the largely unsupervised Ph.D. theses of the respective authors. The model by Phillips, below, includes the beta effect in an analytically tractable way by using a two-level model. Phillips, N., 1951. A simple three-dimensional model for the study of large-scale extratropical flow patterns.J. Meteor., 8, 381--394. Phillips, N., 1954. Energy Transformations and Meridional Circulations Associated with Simple Baroclinic Waves in a Two-Level, Quasi-Geostrophic Model. Tellus, 6, 273--286. The Phillips two-layer or two-level model, described in the 1951 paper and where he also solves the linear instability problem, is perhaps the most transparent model of baroclinic stability of all, and it also allows inclusion of the beta-effect, albeit in a two-layer context. In the 1954 paper he looks at the energetics and the affects of the instability on the mean flow. The two-layer model seems to have been first introduced by Sutcliffe (1947, QJRMS), with further developments by Eady (1952, Tellus), and with a numerical integration of the full nonlinear equations by Phillips (1956, QJRMS). Green, J.S.A., A Problem in Baroclinic Stability. Quart. J. Roy. Meteor Soc., 86, 237-251. The Green model is a numerical treatment of the continuously stratified problem, examining the effects of a lid (i.e., a tropopause) and the beta effect. So it combines the Eady and Charney models in some respects. Durst, C. S. and Sutcliffe, R. C. 1938. The effect of vertical motion on the 'geostrophic departure" of the wind. Quart. J. Roy. Meteor. Soc., 64. 240/ 235-237. This little paper is notable because it seems to be the first to use the phrase 'quasi-geostrophic'. Of course it was Charney (1948, below) who first wrote down a systematic derivation of the QG equations by appropriately scaling the equations. Charney gives a systematic scale analysis of the equations of motion for atmospheric flow, leading to the quasi-geostrophic equations. The QG equations have been perhaps the most important set of equations for our understanding (if not the simulation) of the large-scale structure of the atmosphere and ocean. Dickinson, R. E., 1969. Theory of Planetary Wave-Zonal Interaction. J. Atmos. Sci., 26, 73-81. Thompson, R.O.R.Y., 1971. Why there is an intense eastward current in the North Atlantic but not in the South Atlantic. J. Phys. Oceanog., 1, 235-237. Thompson, R.O.R.Y., 1981. A prograde jet driven by Rossby waves. J. Atmos. Sci., 1, 235-237. The papers by Dickinson and Thompson are perhaps the first calculations of the momentum flux associated with Rossby waves. Thompson shows that the flux in zonal momentum is opposite in sign to the group velocity. This effect reflects the mechanism that gives rise to the maintenance of the surface westerlies in the atmosphere, and it puts 'negative viscosity' on a firmer foundation. It is rather ironic that the effect was first most clearly described in the oceanographic literature and in a paper with a title that invites neglect by meteorologists. The vorticity stirring mechanism of Kuo (click here) underlies the Rossby wave argument and is in some ways more general, at least in so far as the maintenance of the surface westerlies are concerned, for it does not rely on linearizing anything, although it does rely on there being a background gradient of vorticity. Eady, E. T. 1951. The quantitative theory of cyclone development. In: Compendium of Meteorology. Ed., T. F. Malone, Amer. Meteor. Soc., 464�469. This is an interesting paper, because it is contains one of the first discussions of the predictability problem. Eady concludes that: 'We infer that there exist certain ultimate limitations to the possibilities of weather forecasting... weather conditions several days ahead are in principle unanswerable.' A more complete understanding of predictability came via the studies of Phillip Thompson in the 1950s (who looked at it from the point of view of turbulence), and then by Lorenz, first in a statistical-turbulence study that follows on from Thompson and then in his famous 1963 paper in which he essentially demonostrated chaos, and the associated unpredictability, in a low-order model. These will be posted soon. Buckingham, E. 1914. On physically similar systems: illustrations of the use of dimensional equations. Phys. Rev., 4, 345-376. This is the famous 'Buckingham-pi' paper, in which Buckingham lays out how many nondimensional parameters are needed to describe a given system of equations, sometimes known as the Buckingham pi theorem. about any of the above.